Paprika shrimp with a little bit of a spicy kick makes for the perfect appetizer or dinner. 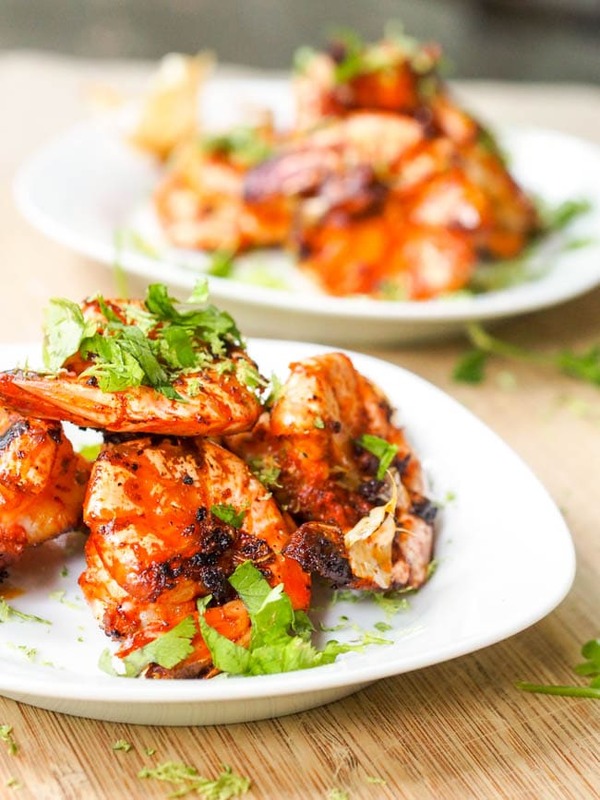 The shrimp cooks in minutes and has the most flavorful, perfect marinade. Paleo, Gluten Free and Dairy Free. Shrimp recipe dishes are my favorite things to whip up. Ok you know I love shrimp right? I mean when I used to come home to see my parents from college, first thing I would make for myself was boiled shrimp, which I would peel while hot and dip right into a big dollop of mayonnaise. Simple, and yet oh so delicious. No face scrunching around here. No judgement. Mayo goes with just about everything as far as I’m concerned and perfectly with shrimp. One thing I hate — cold shrimp. Those shrimp cocktails with the tomato based ketchuppy cocktail sauce. Come on, the shrimps got to be hot! And I love to get my hands messy with it and peel it myself. Well perhaps not on a first date or anything, but since I haven’t been on one of those in years, luckily for me I can peel my own shrimp any time I please. There’s just something about the built up anticipation when you have to actively peel each and every shrimp before consuming it. I’m a fast eater, right, so I need any kind of food based obstacle or hurdle put in front of me to at least slow me down to the average eater’s normal pace. Well this paprika Shrimp recipe right here is all about getting messy and peeling your own shrimp. First though, you must and I mean must literally lick the spices and flavoring off of the shell. Seriously though, not even kidding, that might just be the best part. 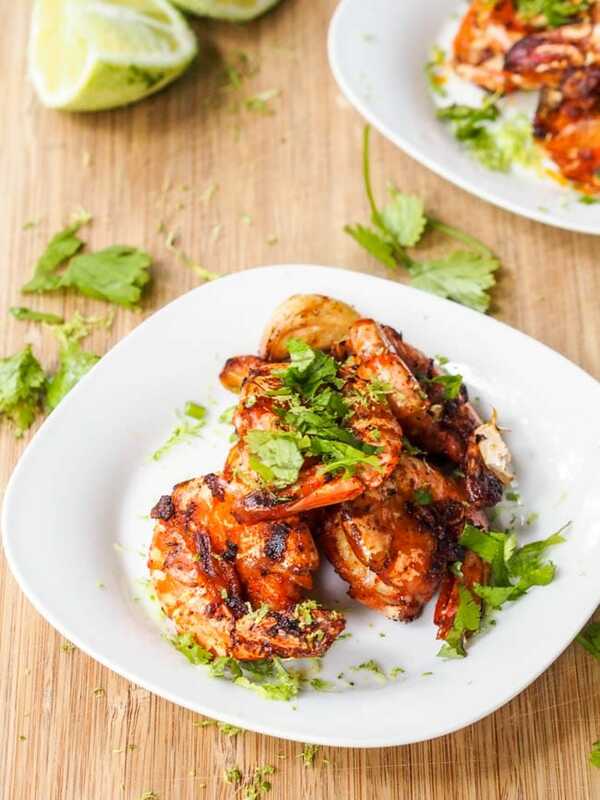 You get your hands on this spicy, garlicky, limey, cilantroy, shrimp and just absorb all of those flavors by slowly sucking it off of the shell. Ok the description may sound a bit absurd but you’ve got to try it. If it floats your boat you could even eat the shell. Really you can! After our travels in Asia we discovered how many people really eat the shrimp with the shell – hey it’s added calcium, but for me it’s just too tough and crunchy. I will happily take in all those delicious ingredients caked onto the shell though. For this paprika shrimp recipe, your shrimp has to be defrosted and completely dried off. I mean completely. Sorry paper towels – a few of you are going to be sacrificed in the making of this recipe. This is vital to getting that awesome char on the shells themselves. Also, this really works best when the shells are still on but the shrimp are deveined. 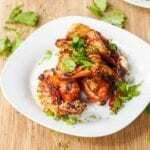 You want the herbs and flavors to get right into the shrimp flesh itself but not so much so that the entire shrimp is coated. The shell protects that from happening while the deveining (or literally just using a sharp sharp knife to make a slit in the back of the shrimp down from the top to the tail) helps spread those flavors. Smoked paprika and spicy paprika or hot cayenne pepper are the masterful spices at work here. Then we got the minced garlic, lime zest (lots of it) and perhaps a sprinkling of garlic powder into the mix. Another great tip – crush a ton of garlic cloves still in their shell (is it a shell? I’ve forgotten what the appropriate term for garlic skin is?) and then heat those up with the olive oil. This allows the oil to become infused with the garlic, but prevents the garlic from burning during the cooking process. The shell (skin?) keeps that from happening. And then — get this — when everything is done, you can pop those garlic cloves right out of their shell and eat them like roasted garlic. You say no way, I say wayyyy. Don’t mind if I do. I gaurantee it you’ll be licking your fingers clean after this dish. Hands down one of my favorite shrimp dishes of all time, the paprika shrimp recipe, and nope, no mayo needed. 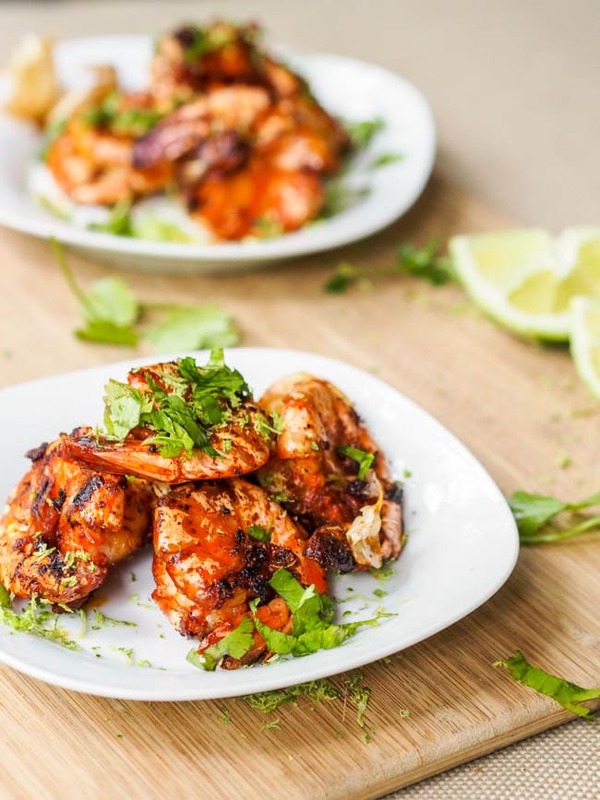 Paleo, dairy-free and cooked in minutes, this paprika shrimp recipe with spicy paprika, lime, and garlic is bound to be a new favorite in your house too! Spicy Paprika Shrimp makes for the perfect appetizer or dinner. The shrimp cooks in minutes and has the most flavorful, perfect marinade. Gluten Free and Dairy Free. Make sure the shrimp is defrosted, rinsed and completely dried. The shrimp must be completely dry. In a large bowl combine shrimp, lime zest, minced garlic, cayenne pepper, smoked paprika, and salt. In a large pan heat olive oil over medium-high heat and add garlic cloves. Once oil is hot and and almost sizzling place shrimp is single layer on the pan (you will have to cook it in batches). Do not overcrowd the pan. Cook on each side for 3-4 minutes or until cooked through and shrimp shell is crispy. Eat by sucking the flavor off the shell first and then peeling and eating the shrimp itself.